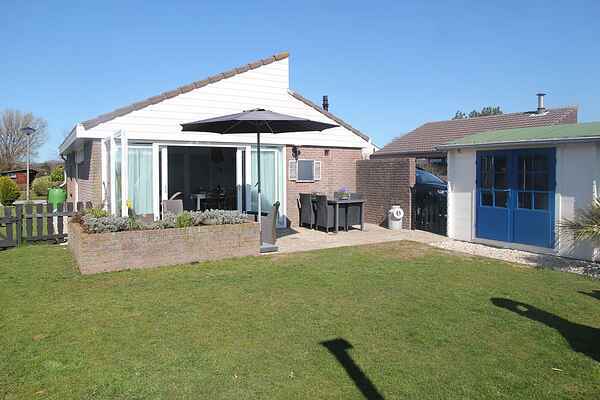 This holiday bungalow is located in a small park on the edge of Egmond aan den Hoef. A great place to experience that true holiday feeling and where you can enjoy magnificent views all day long! It's characterised by its quiet location. The holiday bungalow is comfortable and tastefully decorated. The living room has a seating area, dining area and open-plan kitchen. Here you can relax and socialise with the entire group. Near the holiday home you can enjoy your own wellness hot tub that can be found in the spacious garden. The garden also features a covered patio, where you can sit sheltered until late in the evening. From the patio you have a beautiful view of the polder. A lovely place to unwind and get some rest. You'll also have two bicycles at your disposal. The forest is 500 metres away and you can walk to the small town of Egmond aan den Hoef in ten minutes. If you want more entertainment, you can go to Egmond aan Zee (ten minutes by bike). There you will find the beach, shops and restaurants, etc. It's the ideal base for nature lovers. You can take beautiful hiking and cycling trips in the area. Also make sure to visit the Schoorlse Duinen nature reserve featuring the highest dunes in the Netherlands.